Russia continues to build up and prepare its military forces for possible offensive operations against Ukraine from the Crimean Peninsula and the east. 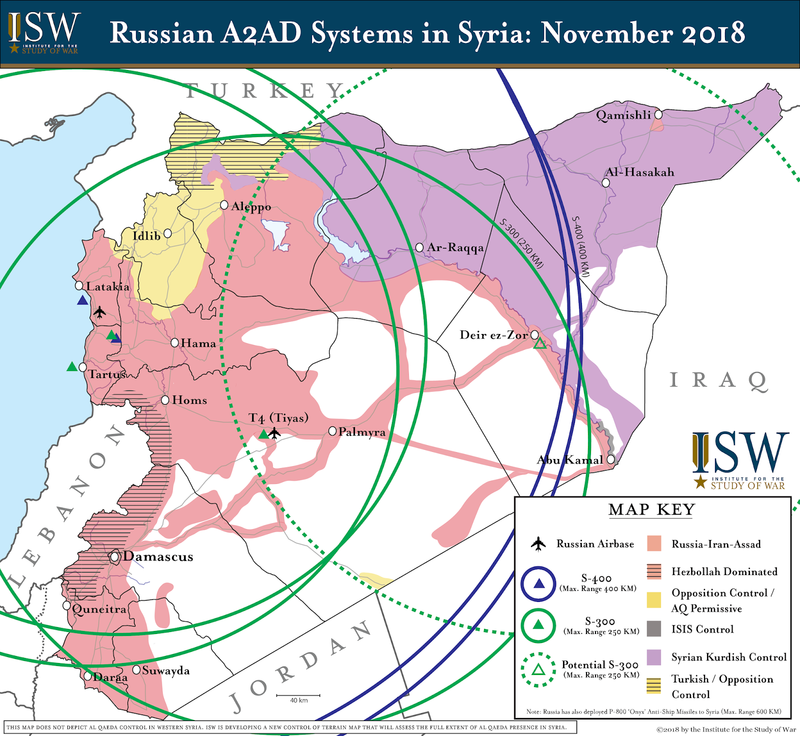 The Institute for the Study of War (ISW) has been warning that Russia could conduct such operations at short notice since December 11, 2018. It remains impossible to assess whether Russian President Vladimir Putin has decided to launch an offensive or will do so, or whether the visible military preparations are intended to pressure Ukraine and its partners without escalating to additional open conflict. The data suggests that Putin is preparing to attack, although alternative interpretations are possible. One can make reasoned arguments about why it would be unwise for him to attack now (or, indeed, at all). The West should nevertheless focus first on the data itself and the risks that flow from it, rather than on reasoning about Putin’s intentions. 19 DEC: Russia is moving military convoys north on the Simferopol-Armyansk highway toward the border between Kherson Oblast’ in Ukraine and Crimea. These convoys include artillery, armored personnel carriers, trucks and a field kitchen. The correspondent of RFE/RL in Crimea observed these convoys moving on December 19 in the village of Pervomayskoye roughly 30 miles from the border with the Ukrainian mainland. ISW cannot assess the sizes of these movements at this time. 20 DEC: Russia is increasing its information campaign to frame Ukraine as the military aggressor should Putin decide to invade. Russian officials, including Foreign Minister Sergei Lavrov, the Foreign Ministry spokesperson, and the head of the Russian Foreign Intelligence Service, are continuing to warn about an imminent Ukrainian attack on Russia-backed separatists in Eastern Ukraine and on the Kherson-Crimea Oblast border at the end of December 2018. This propaganda effort could serve multiple purposes. The Russians may be intending fabricate a threat to rally separatist forces to escalate in eastern Ukraine in order to distract from Russia’s main effort north of Crimea. The Kremlin may also be attempting to frame Ukraine as the main aggressor ahead of a Russia-backed provocation in order to obfuscate blame. 21 DEC: Unidentified Russian submarines of the Black Sea Fleet conducted planned drills in the Black Sea to practice covert movements while submerged. The crew of one submarine carried out separation from surveillance while the crew of another one maintained surveillance as long as possible. The crews attempted to maneuver as covertly as possible during the submerged position. 21 DEC: A Reuters witness spotted a Russian missile frigate 1.5 km off the coast moving from Feodosia towards the Sea of Azov. A helicopter was visible on-board. 22 DEC: Russia shifted 'more than a dozen Su-27 and Su-30 fighter jets' to Belbek Airbase near Sevastopol, Crimea according to an unidentified 'Reuters witness.' The Russian Ministry of Defense had announced on 17 DEC that it would relocate ten Su-27SM and Su-30M2 fighter jets from Krymsk airfield in Krasnodar Territory to the Belbek airfield in Crimea. These data points are consistent with preparations for an attack from the northern Crimean Peninsula toward the Dnepr River near the city of Kherson. Such an attack could be intended to seize the canal supplying fresh water to Crimea, which Ukraine has blocked since the 2014 Russian invasion. Putin would likely unjustifiably claim the right to invade to stop a humanitarian crisis resulting from the blockage of the canal. Such a claim has no legal validity since Crimea remains legally part of Ukraine over which Russia has no rights, and thus the status of the canal is, in law, an entirely internal Ukrainian matter. Accepting Putin’s justification would ipso facto accept the legality of the Russian annexation of Crimea. A Russian occupation of Kherson would allow Russian forces to interfere with—and possibly cut off—ship movement into and out of Mykolaiv, one of Ukraine’s most important ports and shipbuilding centers. Such a development, together with the illegal seizure of Sevastopol and aggression around the Kerch Strait, would leave Ukraine only a single major port (Odesa) outside the Russian area of military influence. 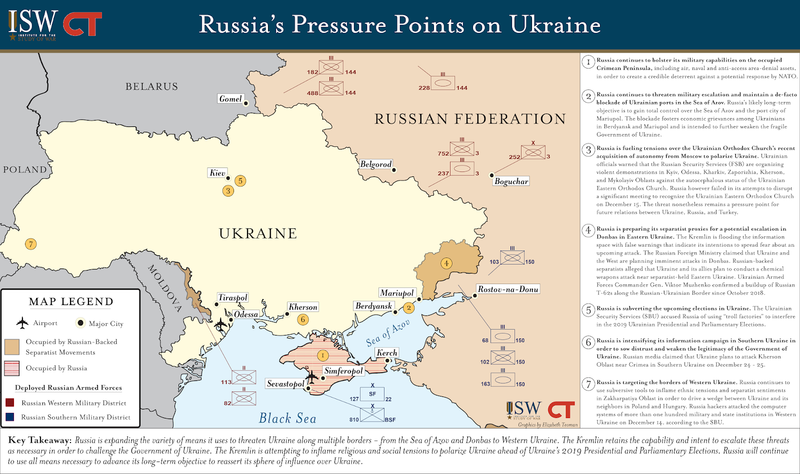 Russian and proxy forces remain poised on Ukraine’s eastern border, near the contested port city of Mariupol and to its north, although ISW has not noted any further major military movements in this area, apart from mining activities and reports of the deployment of an additional sniper unit into this area. It is possible but less likely that Putin could be aiming to seize the areas around this port city, perhaps bypassing the city itself, in an effort to establish control over the coastline along the Sea of Azov. The risk of Russian offensive operations in the last week of December is modestly mitigated by weather. The weather for the next few days appears marginal for an air-ground operation of the sort that would likely be needed for Russian forces to take Kherson, with temperatures forecast to be between 21 and 35 degrees Fahrenheit with periods of rain and snow showers. The disadvantages of weather are temporary. The well-known challenges of fighting in Russia in the winter largely do not apply to southern Ukraine. Rostov-na-Donu, home of the largest concentrations of Russian conventional military power in the region, is roughly 600 miles south of Moscow. The region’s position on the ocean tempers its climate further, compared to the bitter cold of interior Russia. Frozen ground, even with snow, allows rapid armored movements. The Soviets launched the World War II Battle of Stalingrad, 250 miles northeast of Rostov-na-Donu, in late November 1942 and continued it in subsequent operations through February 1943. The principal climatological challenge of fighting in Ukraine is not winter but the spring thaw, which turns vast areas into deep mud. If Putin intends to invade southern Ukraine, climatological considerations would cause him either to move during winter itself or after the thaw. The U.S., NATO countries, and the international community have taken some steps to attempt to deter Russian aggression in Ukraine following the Russians’ illegal seizure of Ukrainian coast guard ships off the Kerch Strait on November 25, 2018. The United Kingdom is sending HMS Echo to the Black Sea, increasing port visits and protecting freedom of navigation. And the United Nations General Assembly passed a resolution on December 17, 2018 calling for Russia to withdraw its armed forces from Crimea and another on December 22, 2018 reaffirming the UN’s position that Crimea is Ukrainian territory and condemning Russian human rights violations during its unlawful occupation of the peninsula. It is possible that Putin is conducting a show of force in response to that resolution, although the buildup is somewhat more extensive and expensive than pure posturing warrants. ISW therefore assesses that Russia has the capability to go on the offensive in Ukraine imminently and is conducting military maneuvers consistent with that intent. Key Takeaway: Russia and Iran are poised to exploit the U.S. withdrawal from Syria announced by U.S. President Donald Trump on December 19. They and their proxies hold positions along the Syrian-Iraqi Border surrounding areas that the U.S. Anti-ISIS Coalition and allied Syrian Democratic Forces (SDF) currently hold. Russia and Iran will undoubtedly attempt to fill the security vacuum left behind by the U.S. in Eastern Syria. The Russo-Iranian Coalition is nonetheless stretched thin and likely cannot secure this new terrain without opening exploitable vulnerabilities for ISIS and Al-Qaeda in Syria and Iraq. Turkey and other regional actors will also likely attempt to exploit this opening to compete for terrain and influence in Syria. This map depicts the Russo-Iranian Coalition’s known positions in Eastern Syria and Western Iraq as of December 21. Position locations are based on information available in open sources reviewed by the Institute for the Study of War. The map does not depict positions held by the SDF and Iraqi Security Forces (ISF). It also does not include locations held solely by the Syrian Arab Army (SAA). UPDATE: The map below was updated with additional data. See the new map with additional data on deployments as of December 19, 2018 here. A subsequent assessment of the Russo-Iranian coalition's posture in early January 2019 is available here. See the previous version of this assessment published in October 2018 here. The U.S. Anti-ISIS Coalition has not yet destroyed the final physical stronghold of ISIS along the Middle Euphrates River Valley in Eastern Syria. ISIS retains control over roughly twenty kilometers of terrain that it uses as a staging ground for counterattacks on the Syrian Democratic Forces (SDF). The SDF reportedly seized the majority of the town of Hajin on December 14. The urban center remains contested and partner forces were only able to progress after an intense and sustained air campaign by the U.S. Anti-ISIS Coalition. ISIS is intensifying its campaign to destabilize Ar-Raqqa City – its de facto former capital and the nucleus for reconstruction efforts by the U.S.Anti-ISIS Coalition in Northern Syria. ISIS detonated a Vehicle-Borne Improvised Explosive Device (VBIED) in Ar-Raqqa City on November 4. The blast marked the first such attack in Ar-Raqqa City since its seizure by the SDF and U.S. Anti-ISIS Coalition in October 2017. ISIS has expanded the support zones where it enjoys freedom of movement in rural Ar-Raqqa Province. ISIS still retains a support zone in the rural desert of Central Syria. ISIS scattered its fighters into Eastern Homs Province after the conclusion of a pro-regime offensive on the Al-Safa Region on the Syrian-Jordanian Border on November 17. The Syrian Arab Army (SAA) claimed to defeat ISIS in Al-Safa while activists reported that ISIS had evacuated under a deal brokered by Russia. ISIS likely maintains access to the Syrian-Jordanian and Syrian-Iraqi Borders as well as the key crossroads town of Palmyra in Central Syria. ISIS has also expanded its support zone in the rural desert near Abu Kamal in Southern Deir ez-Zour Province. ISIS has relied upon a dense network of caves and tunnels as well as the transfer of reinforcements from the Al-Safa Region of Southern Syria in November 2018. 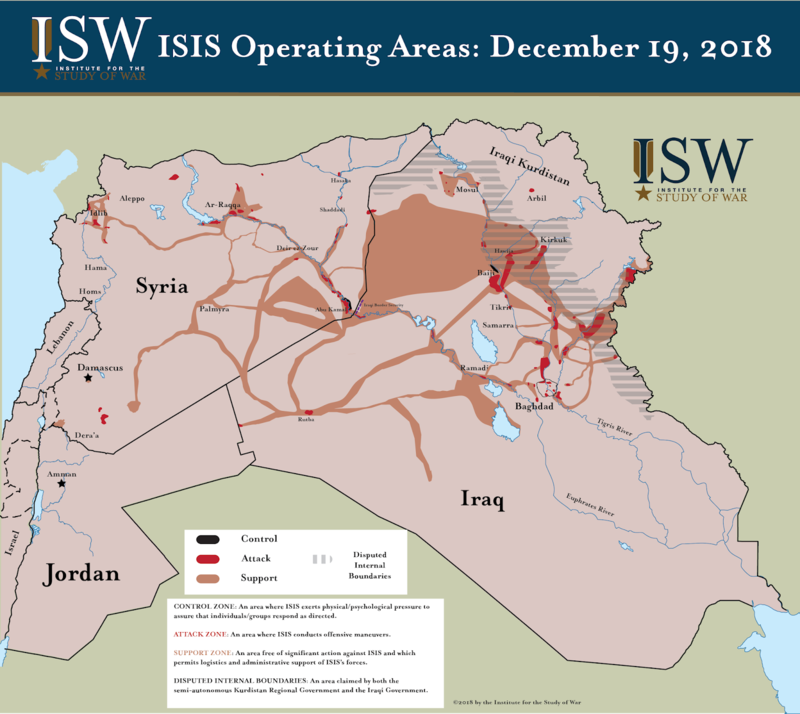 ISIS has thus far conducted only limited operations near Abu Kamal but it could threaten key oil infrastructure such as the T2 and T3 Pumping Stations in Central Syria. ISIS has built upon its support and attack zones near Mosul in Northern Iraq. ISIS detonated a VBIED in Mosul on November 8. The blast marked the first such attack in Mosul since its seizure by Iraqi Security Forces (ISF) and the U.S. Anti-ISIS Coalition in July 2017. ISIS had previously demonstrated its regenerating capabilities with additional VBIEDs in Southern Ninewa Province on October 23, Kirkuk City on October 13, and Northern Salah ad-Din Province on September 12. ISIS has also sustained its assassination campaign targeting Sunni tribal leaders near Mosul. The cell responsible for this campaign is likely based in a support zone in the Adayah Foothills southwest of Mosul. ISIS is consolidating its durable support zone in Northern Diyala Province. ISIS expanded its attack zone northeast of Lake Hamrin near Khanaqin on the Iraqi-Iranian Border. ISIS has also raided villages around the triangle formed by Qara Tapah, Jalula, and Khanaqin. The ISF remains largely fixed in a static military base in Sadiyah south of Jalula. The ISF failed to secure this area during celebrations of Arbaeen by Iraqi Shi’a in October 2018. ISIS is resurging in the Western Baghdad Belts. ISIS has sustained an assassination campaign targeting Sunni tribal leaders west of Baghdad despite clearing operations by the ISF and Popular Mobilization Forces (PMF). ISIS also detonated a VBIED in Fallujah on October 6. The blast marked the first such attack in Fallujah since its seizure by the ISF and U.S. Anti-ISIS Coalition in June 2016. “Continuous Clashes Between SDF and ISIS in Areas Within the Last Enclave East of Euphrates,” Syrian Observatory for Human Rights, November 19, 2018, http://www(.)syriahr.com/en/?p=109523. “After the Deal of Handing Over the Kidnapped People, Hundreds of ISIS Members Vanish from Tlul al-Safa After 116 Days of the Deadliest Attack Ever in Al-Suwaida,” Syrian Observatory for Human Rights, November 17, 2018, http://www(.)syriahr.com/en/?p=106885. [“Leader in the Popular Mobilization Forces Killed During a Security Operation in Diyala,”] Al-Ghad Press, November 18, 2018, https://www(.)alghadpress.com/news/%D8%A3%D8%AE%D8%A8%D8%A7%D8%B1-%D8%A7%D9%84%D8%B9%D8%B1%D8%A7%D9%82/183291/%D9%85%D9%82%D8%AA%D9%84-%D9%82%D9%8A%D8%A7%D8%AF%D9%8A-%D9%81%D9%8A-%D8%A7%D9%84%D8%AD%D8%B4%D8%AF-%D8%AE%D9%84%D8%A7%D9%84-%D8%B9%D9%85%D9%84%D9%8A%D8%A9-%D8%A7%D9%85%D9%86%D9%8A%D8%A9-%D8%A8%D8%AF%D9%8A%D8%A7%D9%84%D9%89. Karzan Sulaivany, “Iraqi Police Arrest Suspect Who Tried to Plant Bomb at Security Members Home,” Kurdistan24, October 30, 2018, http://www(.)kurdistan24.net/en/news/3aa4669a-af06-42ac-90ad-82933b30b123. Key Takeaway: Russia is expanding the variety of means it uses to threaten Ukraine along multiple borders - from the Sea of Azov and Donbas to Western Ukraine. The Kremlin retains the capability and intent to escalate these threats as necessary in order to challenge the Government of Ukraine. The Kremlin is attempting to inflame religious and social tensions to polarize Ukraine ahead of Ukraine’s 2019 Presidential and Parliamentary Elections. Russia will continue to use all means necessary to advance its long-term objective to reassert its sphere of influence over Ukraine. Russia continues to bolster its military capabilities on the occupied Crimean Peninsula, including air, naval and anti-access area-denial assets, in order to create a credible deterrent against a potential response by NATO. Russia continues to threaten military escalation and maintain a de-facto blockade of Ukrainian ports in the Sea of Azov. Russia’s likely long-term objective is to gain total control over the Sea of Azov and the port city of Mariupol. The blockade fosters economic grievances among Ukrainians in Berdyansk and Mariupol and is intended to further weaken the fragile Government of Ukraine. Russia is fueling tensions over the Ukrainian Orthodox Church’s recent acquisition of autonomy from Moscow to polarize Ukraine. Ukrainian officials warned that the Russian Security Services (FSB) are organizing violent demonstrations in Kyiv, Odessa, Kharkiv, Zaporizhia, Kherson, and Mykolayiv Oblasts against the autocephalous status of the Ukrainian Eastern Orthodox Church. Russia however failed in its attempts to disrupt a significant meeting to recognize the Ukrainian Eastern Orthodox Church on December 15. The threat nonetheless remains a pressure point for future relations between Ukraine, Russia, and Turkey. Russia is preparing its separatist proxies for a potential escalation in Donbas in Eastern Ukraine. The Kremlin is flooding the information space with false warnings that indicate its intentions to spread fear about an upcoming attack. The Russian Foreign Ministry claimed that Ukraine and the West are planning imminent attacks in Donbas. Russian-backed separatists alleged that Ukraine and its allies plan to conduct a chemical weapons attack near separatist-held Eastern Ukraine. Ukrainian Armed Forces Commander Gen. Viktor Muzhenko confirmed a buildup of Russian T-62s along the Russian-Ukrainian Border since October 2018. Russia is subverting the upcoming elections in Ukraine. The Ukrainian Security Services (SBU) accused Russia of using “troll factories” to interfere in the 2019 Ukrainian Presidential and Parliamentary Elections. Russia is intensifying its information campaign in Southern Ukraine in order to sow distrust and weaken the legitimacy of the Government of Ukraine. Russian media claimed that Ukraine plans to attack Kherson Oblast near Crimea in Southern Ukraine on December 24 - 25. Russia is targeting the borders of Western Ukraine. Russia continues to use subversive tools to inflame ethnic tensions and separatist sentiments in Zakharpatiya Oblast in order to drive a wedge between Ukraine and its neighbors in Poland and Hungary. Russia hackers attacked the computer systems of more than one hundred military and state institutions in Western Ukraine on December 14, according to the SBU. 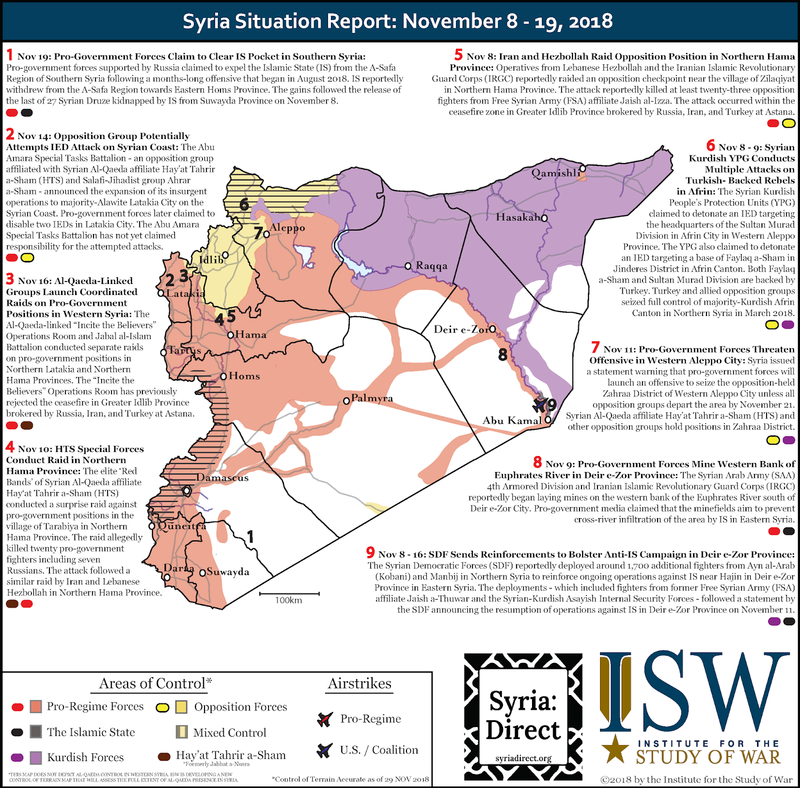 The following graphic marks the latest installment of the Syria Situation Report (SITREP) Map made possible through a partnership between the Institute for the Study of War (ISW) and Syria Direct. The map depicts significant developments in the war in Syria during the period November 29 - December 12, 2018. Key Takeaway: Russia is poised to escalate its campaign in Ukraine at a time when domestic crises, partly fueled by the Kremlin, distract key U.S. allies in Europe. America’s three most important allies in NATO - France, Germany, and the United Kingdom - face ongoing political instability even as events in Eastern Europe divert the attention of NATO. These crises all have domestic roots, but nearly all of them are being fanned or influenced by the Kremlin. The crises occupy the attention of critical political leaders in NATO and have already contributed to weak responses by NATO and the EU to Russia’s aggression in the Kerch Strait. Russian President Vladimir Putin likely calculates that crucial NATO leaders are currently too weak and preoccupied with domestic affairs to respond meaningfully to further escalation. This calculus increases the likelihood that Putin may commit additional acts of aggression, such as the seizure of additional territory in Eastern Ukraine. Update (December 14, 2018): The text for the fourth point in the map has been updated to reflect a significant development in Kosovo's Parliament. Turkey Brief is a biweekly intelligence summary (INTSUM) produced by the Institute for the Study of War (ISW). This ISW INTSUM series sheds light on key trends and developments related to the Turkish government’s objectives and its efforts to secure them. Key Takeaway: Turkish President Recep Tayyip Erdogan is unlikely to meaningfully challenge Russia’s increasing aggression in the Black Sea despite its harm to the interests of both Turkey and NATO. He is instead remaining effectively neutral in order to preserve a cooperative relationship with the Kremlin that provides him economic benefits and freedom of action in Syria. Erdogan’s effective neutrality in the Black Sea is a boon to Russian President Vladimir Putin, who is currently prepared to launch a renewed ground offensive against Ukraine. Turkey is unlikely meaningfully to contest Russia’s recent aggression in the Black Sea. Turkish President Recep Tayyip Erdogan has been muted in response to Russia’s illegal attack against the Ukrainian Navy in the Kerch Strait on November 25. Russia’s aggression is a threat to the sovereign rights of Turkey in the Black Sea. Erdogan has nonetheless prioritized high-level diplomatic engagement over a military response. He urged de-escalation in separate phone calls with Russian President Vladimir Putin, Ukrainian President Petro Poroshenko, and U.S. President Donald Trump on November 28. He later attempted but failed to mediate the release of the Ukrainians detained by the Kremlin. Erdogan also ordered small-scale military exercises to reassure his population. The Turkish Navy began a limited three-day naval drill in the Black Sea on December 11. It also will hold recurring small-scale exercises in the Dardanelles Strait throughout December 2018. These maneuvers are too limited in scope and scale to deter Russia. Erdogan is likely unwilling to jeopardize his deepening bilateral relationship with the Kremlin by counter-escalating in the Black Sea. Turkey and Russia are jointly constructing the TurkStream natural gas Pipeline under the Black Sea. TurkStream grants greater leverage to Erdogan as a key energy transit hub to Europe while diversifying the export options available to Putin. Turkey also has a vested economic interest in the continued flow of commercial shipping to Ukraine and Russia via the Kerch Strait. Turkey remains heavily dependent on trade and tourism from Russia. Turkey similarly relies upon Russia to protect its freedom of action against the Syrian Kurdish YPG in Syria as well as to uphold a delicate demilitarized zone in al Qaeda-dominated Idlib Province. Erdogan may also doubt that NATO will fully support him in a confrontation with Russia in the Black Sea. His effective neutrality in the latest crisis is a boon for Putin, who is currently prepared to launch a renewed ground offensive against Ukraine. Erdogan nonetheless hopes to retain a growing relationship with Ukraine despite his unwillingness to confront Russia over the Kerch Strait. Erdogan has forged closer economic, diplomatic, and defense ties with Ukraine since 2014. He has repeatedly reaffirmed support for the territorial integrity of Ukraine. Erdogan seeks to expand his indigenous defense industry through greater technology exchange with Ukraine. He also likely supported the recent decision of the Ecumenical Patriarchate of Constantinople to grant autonomy to the Ukrainian Orthodox Church on October 11. The Russian Orthodox Church in response severed ties with Constantinople. He has also preserved a historic cultural patronage of Ukraine’s Turkic Crimean Tatars - a population resistant to Russia’s illegal occupation of the Crimean Peninsula. Erdogan actively intervened to secure the release of two leading Crimean Tatars from Russia in October 2017. His government also plans to construct a Crimean Tatar Cultural Center in Kiev by 2019. Erdogan will likely sustain these lines of effort in order to counterbalance against Russia in the Black Sea. [“Response from Peskov to Erdogan: We Are Grateful But There Is No Need,”] Sputnik, November 29, 2018, https://tr(.)sputniknews.com/rusya/201811291036386530-peskov-erdogan-sorusuna-yanit/. [“Safety of Navigation,”] Turkish Naval Forces Office of Navigation, Hydrography, and Oceanography, December 10, 2018, http://www(.)shodb.gov.tr/shodb_esas/index.php/en/safety-of-navigation/navigational-warnings/all-stations/20-all-stations/samsun-navtex-station/1712-turnhos-n-w-1252-18. [“Visit of Minister of Foreign Affairs Mevlut Cavusoglu in Milan to Attend OSCE 25th Council of Ministers Meeting, 6-7 December 2018,”] Turkish Ministry of Foreign Affairs, December 7, 2018, http://www(.)mfa.gov.tr/disisleri-bakani-mevlut-cavusoglu-nun-agit-25-inci-bakanlar-konseyi-toplantisi-na-katilimi-6-7-aralik-2018.tr.mfa. Russia is taking overt steps towards open conflict with Ukraine. Russia has been waging a covert war against Ukraine using proxy separatist forces in eastern Ukraine since 2014. The Russian military is now preparing its forces for direct military involvement. The Kremlin is reinforcing ground, naval, and air elements in its Southern Military District - the command likely responsible for managing its ongoing war in Ukraine. Moscow may calculate that the international community will not meaningfully respond if the visibility of its role in the war now increases. Ground: Russia reportedly transferred an additional mechanized regiment to the 150th Motor Rifle Division (MRD) on December 2. The 150th MRD is a uniquely tank-heavy unit subordinate to the 8th Combined-Arms Army located 20-30 kilometers from the Russian-Ukrainian border. ISW previously assessed that the 150th MRD could support a ground advance by Russia along the northern coast of the Sea of Azov if the Kremlin launched a large-scale offensive against Ukraine. The Kremlin has also increased the number of armored vehicles along the Russian-Ukrainian border. Ukrainian Armed Forces Commander General Viktor Muzhenko has publicly warned of a significant buildup of Russian T-62M Main Battle Tanks along the Russian-Ukrainian border that had occurred by October 2018. 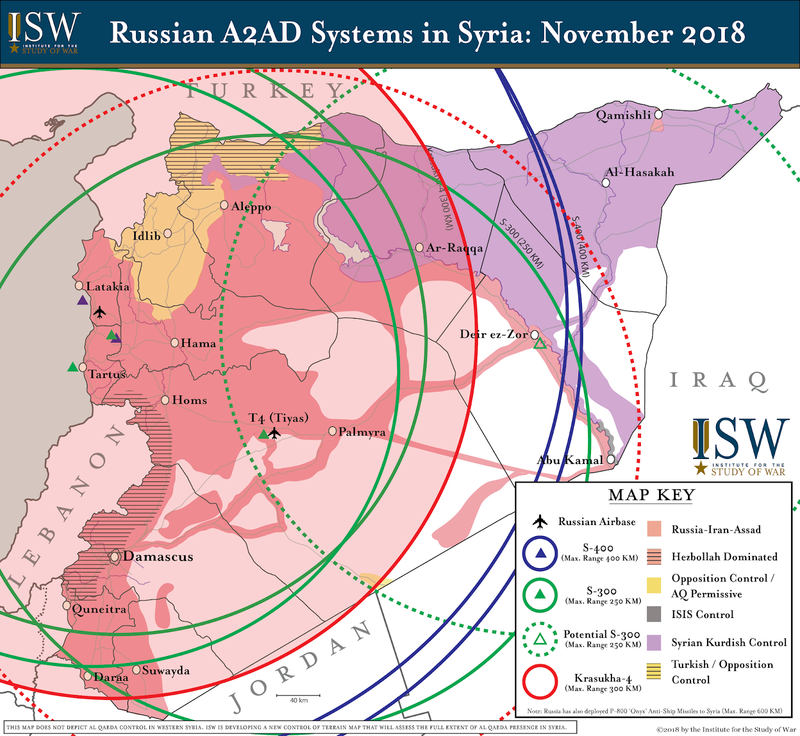 ISW had previously warned about this mobilization in September 2018. Air: Russia is likely integrating additional airmobile units into existing units in the Southern Military District (SMD). SMD Commander Colonel General Aleksandr Dvornikov announced earlier this year that new airmobile units would begin training with naval infantry in the Black Sea Fleet and Caspian Flotilla beginning in December 2018. It is not yet clear if these units have begun their training missions. Sea: Russia is also bolstering the capabilities of its Black Sea Fleet. Russia added a new corvette equipped with cruise missiles to the Black Sea Fleet on December 7. Russia is expected to add four additional warships including patrol boats and minesweepers to the Black Sea Fleet by the start of 2019. Russia also conducted naval and missile drills involving two submarines and Pantsir Surface-to-Air Missile Systems (SAMS) in the Black Sea and Crimean Peninsula on December 5. Russia may also be preparing its Central Military District to support the Southern Military District in a conflict. Russia began snap preparations for its “Center-2019” military exercise on December 1. These exercises will not take place until September 2019. This early start to the exercises is atypical and may signal preparation for open conflict with Ukraine under the auspices of military exercises. Russia has previously used military exercises as cover to prepare for offensive operations. The initial phase of the Center-2019 exercise includes “moving from peace to wartime posture” and moving supplies and field hospitals to aid potential casualties in combat. Russian units conducted these exercises in the Volga region northeast of the Southern Military District. Russia may intend to use resources in the Central Military District to support the Southern Military District in rear areas. 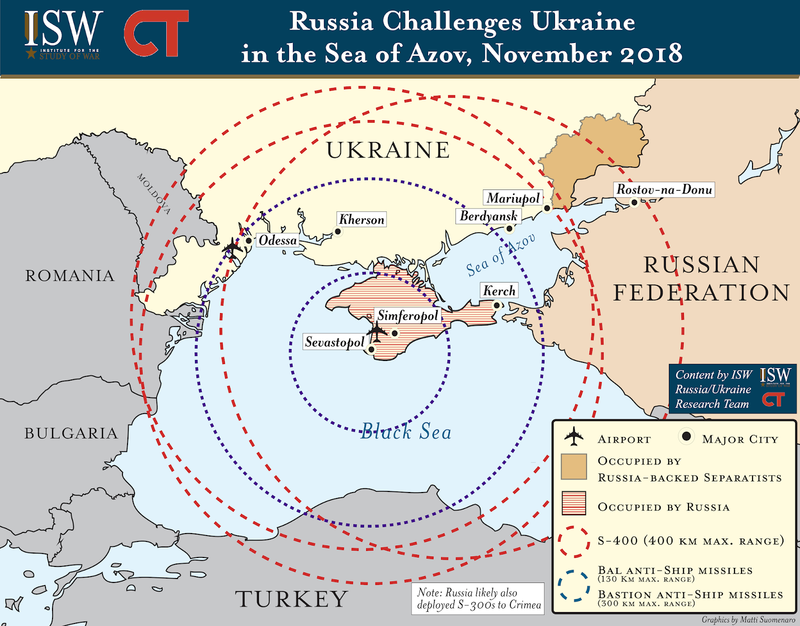 Alternatively, Russia may be attempting to deter a Ukrainian military response to Russia’s escalation against Ukraine in the Sea of Azov on November 24-25. Russia may however calculate that conditions are set such that Russia should escalate now. Russia may be preparing to fabricate or launch a chemical weapons attack in Ukraine in order to create a false pretext to escalate against Ukraine. Russia is currently flooding the information space with multiple narratives to alarm the local population in Ukraine and frame the West as the aggressor likely in order to set conditions for a future escalation by Russia. One Kremlin narrative claims that Western personnel are preparing to conduct a chemical weapons attack in territory currently controlled by Russia-backed separatists. A spokesperson from the Russia-backed separatist region of the Donetsk People’s Republic (DNR) claims that the Ukrainian Armed Forces will launch an assault on Mariupol on December 14. These false narratives may represent efforts by Russia to create a false justification for anticipated overt military involvement. This fabrication would be consistent with recent Russian provocations in Syria. Russia and the Syrian regime fabricated a chemical weapons attack in Syria on November 24. Russia responded to this fabricated chemical weapons attack with Russian airstrikes. The U.S. condemned Russia and the Assad regime for this fabrication but did not meaningfully respond. The Kremlin may therefore calculate that it can use the same play in Ukraine at this time. Russia likely perceives the lack of a unified NATO response to Moscow’s aggression in the Sea of Azov as an opportunity to escalate against Ukraine and elsewhere in the future. NATO failed to agree on a unified course of action in response to Russia’s escalation in the Kerch Strait during a foreign ministerial meeting on December 4-5. Moreover, NATO member-states are signaling different degrees of concern over overt Russian escalation. None of the responses are likely sufficient to deter Putin, whereas the disagreement itself will likely embolden him. United States: The U.S. has demonstrated the strongest response to Russia’s aggression, though it is likely insufficient to deter further offensive action by Russia in Ukraine. U.S. Commander of EUCOM and Supreme Allied Commander Europe (SACEUR) General Scaparrotti will meet with Russian Chief of the General Staff Valery Gerasimov in Azerbaijan on December 12. The U.S. is attempting to constrain Russia and prevent it from making future illegal claims to other bodies of water. The U.S. is preparing the option of sending a warship, likely from the 6th Fleet, to the Black Sea in coordination with Turkey in a likely effort to deter Russia from expanding its aggression into the Black Sea. The United States also conducted a freedom of navigation exercise in the Sea of Japan near the Russia-claimed Kuril Islands on December 5 in a move that U.S. officials called a direct challenge to Russian naval activity in the Pacific theater. This U.S. maneuver follows Russia’s announcement that it will pass legislation requiring foreign ships to notify the Kremlin before traversing the Northern Sea Route in 2019. The U.S. with allies also conducted a flight over Ukraine under the Open Skies Treaty to reaffirm support for Ukraine and European nations on December 6. European Union: The EU will likely fail to pass additional sanctions on Russia. The UK called for the EU to enact “appropriate sanctions” in response to Russian aggression, though this effort will be unsuccessful. France and Germany have signaled their unwillingness to impose further sanctions on Russia and their preference to pursue a diplomatic solution to the escalation. French officials are furthermore currently distracted by large-scale protests in France that may be partially fueled by Russian disinformation. Turkey: Ankara is attempting to demonstrate Turkish resolve in the Black Sea. Turkey is currently conducting live-fire exercises in the southeastern portion of the Black Sea from December 10-14 and recently announced recurring small-scale exercises in the Dardanelles Strait throughout December. Russia will continue to divert attention away from Russia’s escalating pattern to undermine a stronger NATO response. Putin will likely use a mixture of incentives and pressures on Turkish President Recep Tayyip Erdogan to increase the likelihood that Erdogan will not meaningfully challenge a future escalation by Russia against Ukraine. Russia likely already initiated this effort in the Syrian theater. Russia conducted airstrikes within hundreds of meters of a Turkish military position in Western Aleppo Province, Syria under the false pretext of retaliating against anti-Assad forces for using chemical weapons on November 26. Russia may have intended to use this set of airstrikes to test international reactions to a fabricated chemical weapons attack; to compel Turkey to back down in the Black Sea; and to divert international attention away from its military escalation against Ukraine and toward an alleged chemical weapons attack in Syria. The Kremlin will also likely use subversive methods to fuel protests in France and possibly other NATO member-states in order to create distractions and divert resources away from a future escalation by Russia. The U.S. and NATO must be increasingly prepared for an emboldened Russia to escalate in multiple theaters. Russia has previously demonstrated its ability to simultaneously escalate its various malign campaigns against the West in multiple theaters. Russia likely feels more emboldened to do so at this time following NATO’s inaction. NATO must therefore be prepared for Russia to escalate in Ukraine but also in other theaters, such as Syria. 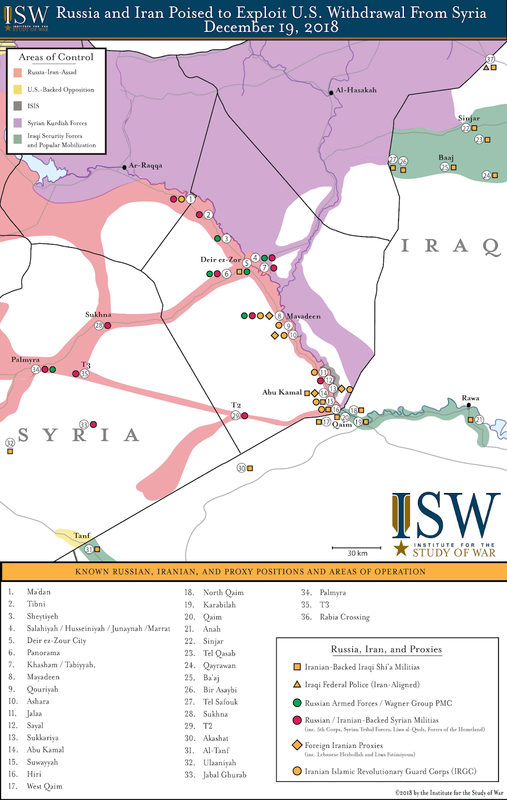 ISW has repeatedly warned that Russia, Assad, and Iran are setting military conditions to ultimately expel the U.S.-led coalition from Eastern Syria. Russia may accelerate both of these efforts simultaneously in a most dangerous scenario. NATO must prioritize deterring an increasingly aggressive Russia in order to maintain the resolve of the NATO alliance and uphold the rules-based international order. 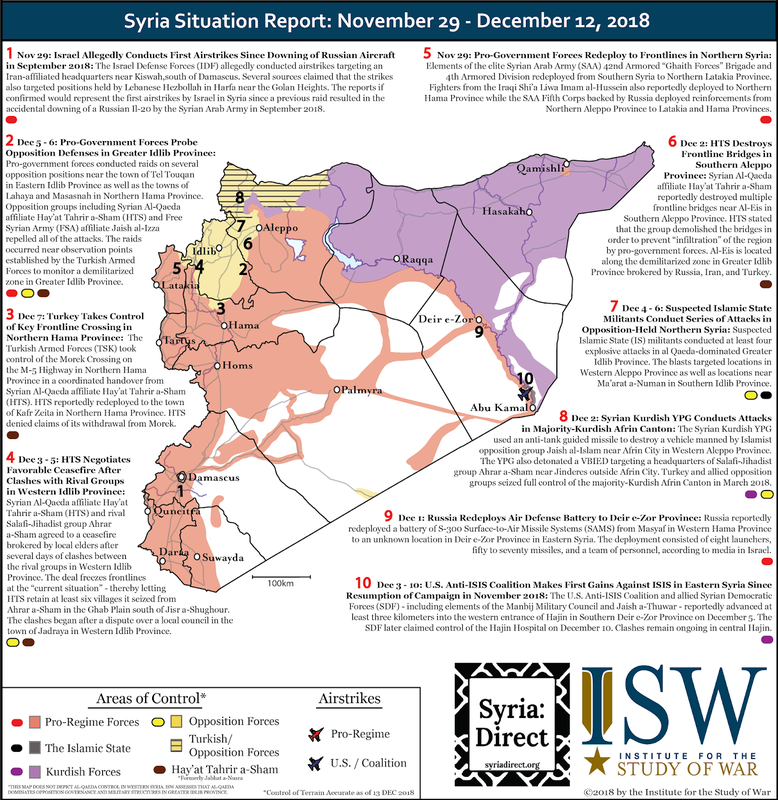 These two graphics mark the latest installment of the Syria Situation Report (SITREP) Map made possible through a partnership between the Institute for the Study of War (ISW) and Syria Direct. The maps depict significant developments in the war in Syria during the period November 8 - 29, 2018. Russia has finished an advanced anti-access / area denial (A2AD) network that constrains U.S. freedom of maneuver in Syria and the Eastern Mediterranean Sea. The zone integrates air defense and electronic warfare systems imported from Russia with modernized equipment formerly operated by Syria. Russia began building these capabilities immediately after its intervention in Syria in 2015. The Russian Armed Forces established a partial independent air defense network to protect its military assets at the Hmeimim Airbase and Tartus Naval Facility on the Mediterranean Coast. Russia initially deployed a single battalion of S-400 Surface-to-Air Missile Systems (SAMS) to Hmeimim Airbase in November 2015. (Note a) It later deployed at least three additional air defense battalions - two S-400s and one S-300 - to create an overlapping network in Northern Syria by August 2017. Russia integrated these platforms with radar systems of the Syrian Air Defense Forces in order to expand its ability to monitor airspace over Syria. Russia also operated limited command-and-control and targeting systems in Syria as of August 2017. The Russian Armed Forces likely deployed the Barnaul-T - a mobile command-and-control system for short-range air defense systems - to Syria in 2015. It also reportedly deployed at least one advanced 1L122-1E targeting radar to Syria according to unconfirmed images on social media. Russian Airborne Forces began training with the 1L122-1E as a component of the Barnaul-T for the first time in February 2016 and later marketed it for export in July 2018 after field tests in Syria. The 1L122-1E can provide targeting information to various short-range air defense systems including the Osa (SA-8), Strela-10 (SA-13), and Man-Portable Air-Defense Systems (MANPADS). (Note b) This air defense network nonetheless did not cover all of Syria or subordinate the Syrian Air Defense Forces to Russia as of August 2017. The Russian Ministry of Defense estimated that it would require two battalions of S-400s and three to four battalions of S-300s to completely control the airspace over Syria. Russia further expanded its deployment of air defense systems in Syria in 2018. Russia first expressed its intent to further expand its network after a reported chemical weapons attack prompted airstrikes against Syria by the U.S., France, and Britain on April 14. Russian Federation Council Defense and Security Committee Chair Viktor Bondarev stated that Russia could respond to the strikes by establishing a “multi-layered and highly-efficient air defense system” in Syria. Russia accelerated this effort after the Syrian Air Defense Forces accidentally shot down a Russian IL-20 while responding to airstrikes by Israel on September 17. The Russian Armed Forces deployed at least three additional battalions of S-300s to Syria by October 2. These systems reportedly became combat operational as of November 7, although satellite images later showed at least one of the battalions still stationed at a storage site as of November 13. ISW cannot independently verify the status of the other two battalions of S-300s. These recent deployments significantly widen the geographic reach of Russia’s air defense network in Syria. Russia positioned the first new battalion of S-300s in the mountains of Tartus Province along the Syrian Coast. This battalion is located within two kilometers of pre-existing positions occupied by a Russian S-400 and Syrian S-200. Russia reportedly positioned the second battalion at the T4 (Tiyas) Airbase northeast of Damascus. The location of the third battalion is unclear although it may be deployed to the Deir ez-Zour Military Airbase in Eastern Syria. This position - if confirmed - could significantly constrain air operations by the U.S. Anti-ISIS Coalition in Eastern Syria. The graphic below depicts the assessed locations and maximum ranges of the air defense systems operated by Russia in Syria. Russia simultaneously consolidated its command-and-control over the Syrian Air Defense Forces in 2018. The Russian Ministry of Defense announced that it would establish a single control system for air defense systems operated by both Russia and Syria by October 20. This announcement followed more immediate steps to respond to the downing of the Russian IL-20 by Syria in September 2018. Russian Military Police arrested the Syrian Air Defense Forces responsible for downing the IL-20 on September 18. Russia also demanded that Syria begin a thorough investigation into the chain-of-command of the Syrian Air Defense Forces on September 19. The inquiry allegedly focused on air defense units that lacked direct command-and-control connections with Hmeimim Airbase. Russia later allegedly established a new headquarters under its command to integrate all air defense systems operated by Syria. The Russian Ministry of Defense reported on October 31 that it deployed the Polyana-D4 - a mobile command-and-control system for long-range air defense systems - to Syria. The Polyana-D4 is capable of simultaneously directing multiple air defense systems including the S-300, Pantsir-S1 (SA-22), Buk-M2 (SA-17), and Tor-M1 (SA-15). It can exert more control over a wider area than the Barnaul-T. Russia also reportedly modified its S-300s in Syria to synchronize their encryption with radars owned by Syria. Russia now controls an integrated air defense network based in Syria but subordinate to the Russian Armed Forces. Russia has claimed to be training local units in order to ultimately cede control of the network to the Syrian Air Defense Forces. These claims are likely untrue. The Russian Ministry of Defense stated on October 31 that Russia is conducting a three-month training on the S-300 for Syria. Syria had briefly received similar training until Russia aborted a deal to provide S-300s to Syria in June 2012. This short training schedule is insufficient to enable independent operations by the Syrian Air Defense Forces. Russia is more likely training units in basic maintenance and integration of some radars and short-range air defense systems into the new command system led by Russia. Syria also faces systemic challenges to its air defense network due to obsolete equipment and the widespread attrition of the Syrian Air Defense Forces during the Syrian Civil War. Syria likely no longer possesses air defense capabilities independent of Russia. Russia is using its electronic warfare systems to monitor and disrupt operations by the U.S. Anti-ISIS Coalition in Syria. U.S. 3rd Brigade Combat Team, 10th Mountain Division Commander Col. Brian Sullivan stated that his unit faced a “congested…electronic warfare environment” during its deployment in Northern Syria between September 2017 and May 2018. U.S. Special Operations Command (SOCOM) Commander Gen. Raymond Thomas also noted in April 2018 that the U.S. is “operating in the most aggressive [electronic warfare] environment on the planet” with “adversaries…testing us every day [by] knocking our communications down [and] disabling our EC-130s” in Syria. These statements demonstrate the seriousness of the electronic warfare threat posed by Russia in Syria. Russia is likely to continue if not escalate its use of electronic warfare against the U.S. in Syria. Russian Defense Minister Sergey Shoygu stated on September 24 that Russia would jam the satellite navigation, airborne radar, and communication systems of combat aircraft in the Eastern Mediterranean Sea in order to protect its facilities on the Syrian Coast. Shoygu likely issued this threat in order to deter future strikes by the U.S. and Israel against Syria. Russian Deputy Defense Minister Alexander Fomin later accused the U.S. of directing a drone attack against Hmeimim Airbase in October 2018. The claim is a likely attempt to frame the U.S. for a series of drone swarm attacks against Hmeimim Airbase since late 2017, possibly in order to justify the use of electronic warfare against the U.S. in Syria. Russia could use currently-deployed systems to disrupt the communications and reduce the targeting capabilities of aircraft operated by the U.S. Anti-ISIS Coalition in Eastern Syria. The U.S. must be prepared to defend against a future escalation that combines electronic warfare with ground operations again its partner forces in Eastern Syria. Russia ultimately aims to use its technical capabilities as part of its wider campaign to force the withdrawal of the U.S. Anti-ISIS Coalition from Syria. Russia can use these systems to decrease the overall freedom of maneuver - and increase the overall risk - faced by the U.S. in Syria. Russia’s combined air defense and electronic warfare networks will increase the cost of aerial and naval operations by the U.S. in Syria and the Eastern Mediterranean. It raises the cost of future airstrikes to deter chemical weapons attacks by Syrian President Bashar al-Assad. It also increases the cost of future strikes by Israel against Iran in Syria. The U.S. and Israel both must be prepared to suppress a larger number of air defense systems and use more expensive stealth aircraft such as the F-35 in Syria. Russia stands to gain a long-term strategic advantage over NATO through its new capabilities in Syria. The U.S. and NATO must now account for the risk of a dangerous escalation in the Middle East amidst any confrontation with Russia in Eastern Europe. Russia led a gradual modernization program of the Syrian Air Defense Forces prior to the start of the Syrian Civil War. Syria acquired its first short-range air defense systems as well as 11 S-200s from the Soviet Union in the early 1980s. These systems provided a basic air defense capability that could target most aircraft operating in the Middle East. Russia began a program to modernize these systems in 2007. Russia upgraded some Syrian S-125s (SA-3) to the more advanced S-125 Pechora 2M, increasing their effectiveness against modern aircraft. Russia also delivered 50 Pantsir-S1 and 160 Buk-M2s (SA-17) to Syria between 2007 and 2013. The Pantsir-S1 and Buk-M2 provided the capability to target smaller systems including cruise missiles and unmanned aerial vehicles. They also provided a mobile capability to buttress the predominantly-static Soviet S-200s. Syria also upgraded its radars and electronic warfare systems with the purchase of the Chinese JYL-1, JYL-27, and Type 120 in 2009 - 2010. These systems can reduce the effectiveness of stealth aircraft, counter hostile jamming, and enable air defenses to engage multiple simultaneous targets. Russia accepted but later cancelled a deal to provide the S-300s to Syria in 2010 - 2012. Syria primarily concentrated its existing air defense systems to protect its major urban centers in Western Syria. At the start of the Syrian Civil War in 2011, the Syrian Air Defense Forces were capable but lacked new and advanced systems from Russia capable of competing with the West. Russia later intervened to help rebuild the capabilities of the Syrian Air Defense Forces in 2011 - 2016. (Note c) Russian Defense Minister Sergey Shoygu claimed that Russia began to restore Syrian S-200s damaged during the Syrian Civil War in mid-2016. Main Operational Directorate of the Russian General Staff Chief Gen. Sergey Rudskoy identified the need to train local units to operate and maintain modernized versions of the air defense systems already possessed by Syria in April 2018. The overall progress of modernization remains unclear. Russian Ambassador to Syria Alexander Kinshchak stressed that “much is yet to be done” to “restore” systems operated by the Syrian Air Defense Forces as of September 2018. Israel has likely severely degraded the remaining capabilities of the Syrian Air Defense Forces despite the modernization efforts by Russia. Israel conducted airstrikes near Damascus in February 2018 that reportedly destroyed between one-third and one-half of the operational air defense systems of Syria, according to officials in the Israel Defense Forces. Israel later destroyed a short-range Tor-M1 (SA-15) operated by Iran at the T4 (Tiyas) Airbase in central Syria on April 9, according to anonymous intelligence officials cited by the Wall Street Journal. Israel also allegedly conducted a successful electronic warfare attack against the Syrian Air Defense Forces in Homs Province on April 16. Russia reportedly investigated the conditions of the alleged attack. Israel launched a second set of airstrikes in Damascus and Southern Syria that destroyed several air defense systems including Pantsir-S1s (SA-22), Buk-M2s (SA-17), and S-200s (SA-5) on May 9. This attack likely destroyed the bulk of the remaining modernized air defense systems operated by the Syrian Air Defense Forces. [Note a] All references to individual systems or batteries of S-400s and S-300s in this report refer to a battalion-sized element with at least four surface-to-air missile launchers. The number of targeting radars and fire-control vehicles deployed per battalion is unknown. [Note b] Short-range air defense systems provide tactical defense against aircraft within visual range. Modernized medium-range air defense systems can target cruise missiles and low-flying aircraft at ranges below one hundred kilometers. Long-range air defense systems can target cruise missiles and aircraft beyond one hundred kilometers. [Note c] Modernization in the context of this report refers to efforts to upgrade pre-existing air defense systems by making them compatible with new radars, improving their ability to target modern aircraft and missiles, improving their integration with newer air defense systems, increasing their range, improving their hardware, and enabling them to track additional targets. “Russia's First Reported Air Strikes in Syria Assist Regime with Targeting Broader Opposition,” Institute for the Study of War, September 30, 2015, http://iswresearch.blogspot.com/2015/09/russias-first-reported-air-strikes-in.html; “Warning Update: Russia Expanding Facilities at Tartus Naval Base,” Institute for the Study of War, September 30, 2015, http://iswresearch.blogspot.com/2015/09/warning-update-russia-expanding.html; “Russian Deployment to Syria: Putin's Middle East Game Changer,” Institute for the Study of War, September 17, 2015, http://iswresearch.blogspot.com/2015/09/russian-deployment-to-syria-putins.html. “Military Movements After the April 2018 Chemical Weapons Attack,” Institute for the Study of War, April 12, 2018, http://iswresearch.blogspot.com/2018/04/military-movements-after-april-2018.html. “Russia and Syria Create Joint Air Defense System,” TASS, August 25, 2017, http://tass(.)com/defense/962057. [“New Russian Radar-Location System "Garmon" Spotted in Syria for the First Time,”] Rossiskaya Gazeta, March 06, 2018, https://rg(. )ru/2018/03/06/v-sirii-vpervye-zamechena-novejshaia-rossijskaia-rls-garmon.html; Wars Monitoring, Twitter, March 6, 2018, https://twitter.com/warsmonitoring/status/970987567557562368; Encyclopedia of the Syrian Military, Facebook, March 4, 2018, https://www.facebook.com/Encyclopedia.of.Syrian.military/photos/a.177014435742617/1602536153190431. “Russian Airborne Troops Test New Air Defense Control System,” Sputnik, February 15, 2016, https://sputniknews(. )com/military/201602151034779039-ministry-barnaul-test-troops/; [“New Russian Radar-Location System "Garmon" Spotted in Syria for the First Time,”] Rossiskaya Gazeta, March 06, 2018, https://rg(. )ru/2018/03/06/v-sirii-vpervye-zamechena-novejshaia-rossijskaia-rls-garmon.html; Christopher Foss, “Russia Reveals Two New 1L122E-Series Air-Defence Radars,” Jane’s 360, July 3, 2018, https://www.janes.com/article/81510/russia-reveals-two-new-1l122e-series-air-defence-radars; “Russian Airborne Troops Test New Air Defense System,” Sputnik, February 15, 2016, https://sputniknews(.)com/military/201602151034779039-ministry-barnaul-test-troops/. “[Erdogan Is Preparing an Invasion of Syria],” Nezavisimaya Gazeta, January 27, 2016, http://www.ng(.)ru/armies/2016-01-27/1_erdogan.html. “Highly Efficient Air Defense Can Be Created with Russia’s Help - Senator,” TASS, April 18, 2018, http://tass(.)com/defense/1000450. Barbara Starr, Ryan Browne, and Nathan Hodge, “Syria Accidentally Shot Down a Russian Military Plane,” CNN, September 18, 2018, https://www.cnn.com/2018/09/17/politics/syrian-regime-shoots-down-russian-plane/index.html. “Three S-300PM Battalion Sets Delivered to Syria Free of Charge - Source,” TASS, October 8, 2018, http://tass(.)com/defense/1025020. “Russian Specialists Reconfigure S-300 Systems in Syria,” TASS, November 7, 2018, http://tass(. )com/defense/1029616; ImageSat International, Twitter, November 14, 2018, https://twitter.com/ImageSatIntl/status/1062749835932172288. [“Russia Brings S-300 to Hmeimim, Deploys the System in Tartous,”] Zaman al-Wasl, October 7, 2018, https://www.zamanalwsl(. )net/news/article/94321/; “Syria Received Its First S-300 System from Russia and Deployed It 1.3 Kilometers North-West of the Russian S-400 Battery,” ImageSat International, October 24, 201, https://www.imagesatintl.com/new-syrian-s-300-deployment-near-masyaf/. [“Source: Iran Gives “Tiyas” Airbase at Homs to Russia,”] Enab Baladi, October 2, 2018, https://www.enabbaladi(.)net/archives/255109. [“Russia Brings S-300 to Hmeimim, Deploys the System in Tartous,”] Zaman al-Wasl, October 7, 2018, https://www.zamanalwsl(.)net/news/article/94321/. “Russia Completes Deliveries of S-300 Air Defense Systems to Syria – Shoigu,” Sputnik, October 2, 2018, https://sputniknews(.)com/military/201810021068529167-russia-experts-s-300/. [“Anti-Aircraft Battalion in Syria That Shot Down the IL-20 Arrested,”] RUPosters, September 19, 2018, https://ruposters(. )ru/news/19-09-2018/sirii-batalon; Hammurabi News, Twitter, September 18, 2018, https://twitter.com/Hammurabi_News/status/1042129553395789825; Hasan al-Hamadah, Twitter, September 20, 2018, https://twitter.com/hasanalhamada/status/1042798463518429185; Brigadier General Ahmed Rahal, Twitter, September 18, 2018, https://twitter.com/rahhalahmad06/status/1042090935679680512; [“Syrian Anti-Aircraft Gunners Who Shot Down Russian IL-20 Arrested,”] IN24, September 19, 2018, http://in24(.)org/world/33089?utm_source=warfiles(.)ru. [“Zaman al-Wasl Obtains the Names of the Members of the Commission Investigating the Fall of the IL-20,”] Zaman al-Wasl, September 26, 2018, https://www.zamanalwsl(.)net/news/article/93531/. Rasd al-Sham, Twitter, September 18, 2018, https://twitter.com/RasdSham/status/1042206444332957701. Brigadier General Ahmed Rahal, Facebook, September 25, 2018, https://www.facebook.com/100012751608459/posts/561912890910426/. “Syria S-300 Air Defense Brigade Receives Polyana-D4 Automatic Control System,” Army Recognition, November 6, 2018, https://www.armyrecognition(. )com/november_2018_global_defense_security_army_news_industry/syria_s-300_air_defense_brigade_receives_polyana-d4_automatic_control_system.html; Russian Ministry of Defense, “Russian Ministry of Defense Briefing on Syria,” YouTube, October 31, 2018, https://www.youtube.com/watch?v=8BjADBTNLag. “Russian Specialists Reconfigure S-300 Systems in Syria,” TASS, November 7, 2018, http://tass(. )com/defense/1029616; “Russian Specialists Re-Equipping S-300 Systems Delivered to Syria for Local Operation,” TASS, October 19, 2018, http://tass(. )com/defense/1026862; “Three S-300PM Battalion Sets Delivered to Syria Free of Charge - Source,” TASS, October 8, 2018, http://tass(.)com/defense/1025020. Russian Military in Syria, Facebook, October 2, 2018, https://www.facebook.com/Russianmilitaryinsyaria/posts/745457625801587. [“Syria Has Deployed New Krasukha-4 EW Systems,”] Defending Russia, October 15, 2015, https://defendingrussia(. )ru/a/v_sirii_razvernuty_novyje_kompleksy_radioborby_krasuha4-3987/; [“Myths of Military Equipment: How Media Saw the Russian "Krasukha-4" in Action in Syria,”] Riafan, May 30, 2017, https://riafan(.)ru/793901-mify-voennoi-tehniki-kak-smi-uvideli-v-sirii-rabotu-rossiiskoi-krasuhi-4. [“Russian EW Systems Have Proven Themselves in Syria,”] Novye Izvestia, August 20, 2018, https://newizv(.)ru/news/politics/20-08-2018/rossiyskie-kompleksy-reb-horosho-zarekomendovali-sebya-v-sirii. “Russia Says S-300 Missiles Have Already Been Delivered to Syria,” Haaretz, September 29, 2018, https://www.haaretz.com/middle-east-news/syria/russia-says-s-300-air-defense-systems-have-already-been-delivered-to-syria-1.6514112; Leith Aboufadel, “Leaked Photos Show Russia Likely Delivered S-300 to Syria Already,” Al-Masdar News, September 25, 2018, https://www.almasdarnews(.)com/article/leaked-photos-show-russian-military-likely-delivered-s-300-to-syria-already/. [“Russian Mobile Communications Suppressing Complex "Leer-3" Discovered in Syria,”] Military Informant, March 14, 2016, http://military-informant(.)com/army/v-sirii-obnaruzhili-rossiyskie-kompleksyi-podavleniya-mobilnoy-svyazi-leer-3.html. “Russian Drones Can Jam Cellphones 60 Miles Away,” C4ISRNET, November 17, 2018, https://www.c4isrnet(.)com/newsletters/unmanned-systems/2018/11/16/russian-drones-can-jam-cell-phones-60-miles-away/. Sydney Freedberg Jr., “Russian Robots: Fear Jammers, Not Terminators,” Breaking Defense, October 5, 2017, https://breakingdefense.com/2017/10/russian-robots-fear-jammers-not-terminators/; Maksymilian Dura, “Electronic Warfare: Russian Response to the NATO’s Advantage?,” Defense24, May 5, 2017, https://www.defence24(.)com/electronic-warfare-russian-response-to-the-natos-advantage-analysis. Kareem Shaheen, “MSF Stops Sharing Syria Hospital Locations After 'Deliberate' Attacks,” The Guardian, February 16, 2018, https://www.theguardian.com/world/2016/feb/18/msf-will-not-share-syria-gps-locations-after-deliberate-attacks. Joseph Eid, Getty Images, March 31, 2016, https://www.gettyimages.com/detail/news-photo/russian-soldiers-drive-military-vehicles-on-the-road-news-photo/518439684; U.S. Democracy, Twitter, April 4, 2016, https://twitter(.)com/US_Democracy/status/717040870277652482. [“Russian Electronic Warfare Weapons in Syria: Zoopark-1,”] RT, October 17, 2018, https://arabic.rt(.)com/photolines/849796-%D8%A7%D9%84%D8%B3%D9%84%D8%A7%D8%AD-%D8%A7%D9%84%D8%A5%D9%84%D9%83%D8%AA%D8%B1%D9%88%D9%86%D9%8A-%D8%A7%D9%84%D8%B1%D9%88%D8%B3%D9%8A-%D9%81%D9%8A-%D8%B3%D9%88%D8%B1%D9%8A%D8%A7-%D8%B2%D9%88%D8%A8%D8%A7%D8%B1%D9%83-1/. “All Hands On Deck: Russian Military Sets Up High-Tech Radar System in Syria.” Sputnik, March 4, 2016, https://sputniknews(.)com/military/201603041035790897-russia-syria-radar-complex/. “Syrian Forces Retake Historic City of Palmyra from Islamic State,” AP, March 27, 2016, https://www.chicagotribune.com/news/nationworld/ct-syria-palmyra-islamic-state-20160327-story.html. [“Intelligence Directorate Displayed Russian Weapons Brought to Donbass,”] InfoResist, December 11, 2015, https://inforesist(.)org/razvedka-pokazala-oruzhie-kotoroe-zavezla-rossiya-na-donbass/. Maksymilian Dura, “Electronic Warfare: Russian Response to the NATO’s Advantage?,” Defense24, May 5, 2017, https://www.defence24(.)com/electronic-warfare-russian-response-to-the-natos-advantage-analysis. Lara Seligman, “Russian Jamming Poses Threat to US Troops in Syria,” Foreign Policy, July 30, 2018, https://foreignpolicy.com/2018/07/30/russian-jamming-poses-a-growing-threat-to-u-s-troops-in-syria/; “Krasukha-4,” Deagel, April 15, 2017, http://www.deagel.com/Tactical-Vehicles/Krasukha-4_a003129002.aspx; Todd South, “Near-Peer Threats, Disparate Units, Changing Missions: This Army Brigade Did It All on Its Recent Deployment,” Army Times, July 26, 2018, https://www.armytimes(.)com/news/your-army/2018/07/26/near-peer-threats-disparate-units-changing-missions-this-army-brigade-did-it-all-on-its-recent-deployment/. Colin Clark, “Russia Widens EW War, ‘Disabling’ EC-130s or AC-130s in Syria,” Breaking Defense, April 24, 2018, https://breakingdefense.com/2018/04/russia-widens-ew-war-disabling-ec-130s-in-syria/. Josie Ensor, “Russia to Jam Signals in Syria and Supply Regime with More Advanced Anti-Missile Technology After Plane Was Shot Down,” The Telegraph, September 24, 2018, https://www.telegraph.co.uk/news/2018/09/24/russia-jam-signals-syria-supply-regime-advanced-anti-missile/. Dmitry Kozlov and Sergei Grits, “Russia Says Drone Attacks on its Syria Base Have Increased,” AP, August 16, 2018, https://apnews.com/2b07cc798d614d84a32ff83f6abe2e7e. “Update: Pro-Regime Forces Setting Conditions to Attack U.S. 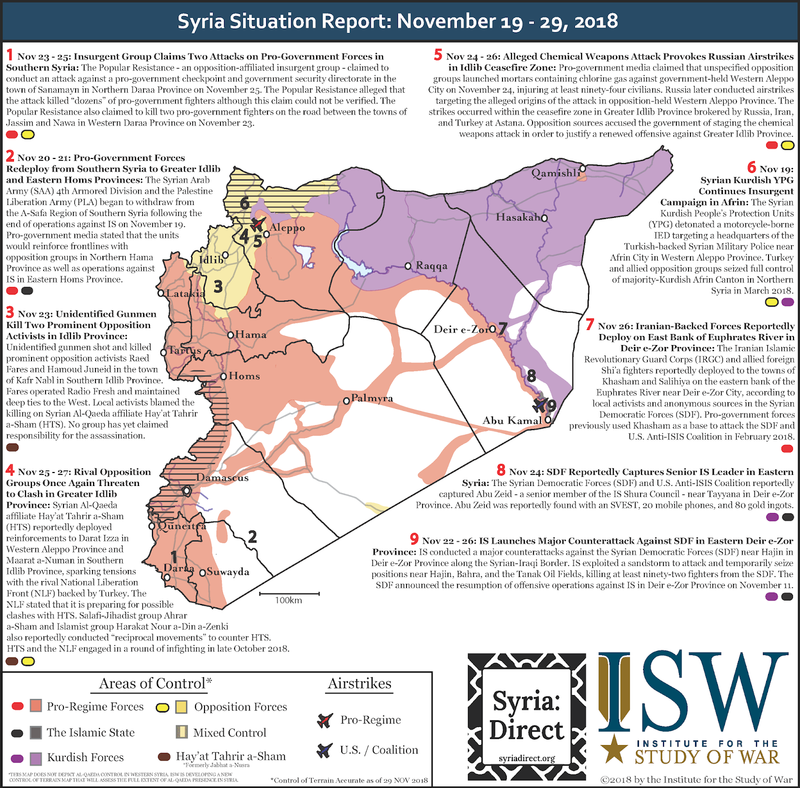 Forces in Eastern Syria,” Institute for the Study of War, August 31, 2018, http://iswresearch.blogspot.com/2018/08/update-pro-regime-forces-setting.html. Dan Williams, “Israel Can Beat Russian Supplied S-300 Air Shield in Syria: Minister,” Reuters, October 3, 2018, https://www.reuters.com/article/us-mideast-crisis-syria-s300-israel/israel-can-beat-russian-supplied-s-300-air-shield-in-syria-minister-idUSKCN1MD28W. Sean O’Connor, “Access Denial – Syria’s Air Defense Network,” IHS Jane’s, April 7, 2014, https://www.janes.com/images/assets/570/36570/Access_Denial.pdf; Stockholm International Peace Research Institute (SIPRI) Arms Transfers Database, https://www.sipri.org/databases/armstransfers. Anthony Cordesman, “Israeli-Syrian Air and SAM Strength Analysis,” CSIS, November 10, 2008, https://www.csis.org/analysis/israeli-syrian-air-and-sam-strength-analysis. Stockholm International Peace Research Institute (SIPRI) Arms Transfers Database, https://www.sipri.org/databases/armstransfers. Sean O’Connor, “Access Denial – Syria’s Air Defense Network,” IHS Jane’s, April 7, 2014, https://www.janes.com/images/assets/570/36570/Access_Denial.pdf. Christopher Harmer, “U.S. 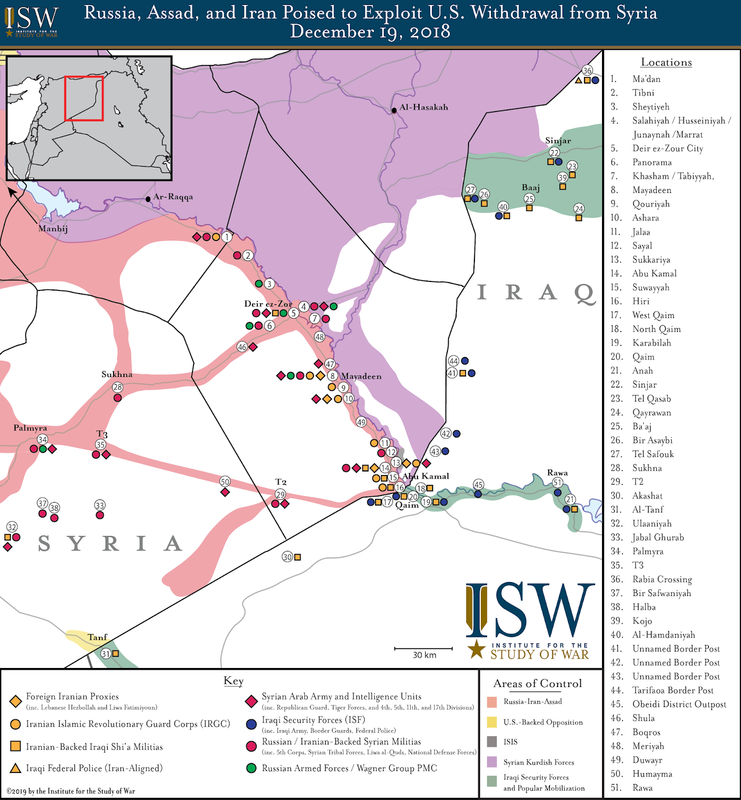 Options for a Syrian No-Fly Zone,” Institute for the Study of War, November 4, 2015, http://www.understandingwar.org/backgrounder/us-options-syrian-no-fly-zone. “A Look at Syrian Air Defenses That Could Not Shoot Down US Tomahawks,” Sputnik, April 24, 2017, https://sputniknews(. )com/middleeast/201704231052904984-syria-air-defense-systems/; “Russian Naval Group in Syria Protected by S-300, Bastion, Pantsir Systems,” Sputnik, November 15, 2016, https://sputniknews(. )com/military/201611151047455462-s-300-syria-russia/; “Russian Carrier Takes Part in Massive Strikes on Terrorists in Syria’s Idlib & Homs,” RT, November 15, 2016, https://www.rt(. )com/news/366995-anti-terrorist-operation-carrier; “Civil War in Syria (8): The Fall of Military Bases,” Military in the Middle East, November 16, 2012, https://milinme.wordpress(.)com/2012/11/16/civil-war-in-syria-8-the-fall-of-military-bases/. “Highly Efficient Air Defenses Can Be Created in Syria with Russia’s Help - Senator,” TASS, April 18, 2018, http://tass(.)com/defense/1000450. “Russia Helping Syria Modernize Its Air Defense System, Ambassador Says,” TASS, September 7, 2018, http://tass(.)com/defense/1020544. Judah Ari Gross, “In Addition to Iranian Targets, Israeli Airstrikes Pummel Syrian Air Defenses,” Times of Israel, May 10, 2018, https://www.timesofisrael.com/in-addition-to-iranian-targets-israeli-strike-pummels-syrian-air-defenses/. Dion Nissenbaum and Rory Jones, “Israel Conferred with U.S. on Strike in Syria to Target Iranian War Gear,” Wall Street Journal, April 17, 2018, https://www.wsj.com/articles/israel-conferred-with-u-s-on-strike-in-syria-to-target-iranian-war-gear-1524001066. Oliver Holmes, “Syrian Claims of Missile Attack on Homs Airbase Were 'False Alarm',” The Guardian, April 17, 2018, https://www.theguardian.com/world/2018/apr/17/syria-missiles-fired-at-air-base-near-homs-state-tv. “Syria Says False Alarm Set Off Its Air Defenses,” Reuters, April 17, 2018, https://www.reuters(. )com/article/us-mideast-crisis-syria-airbase/syria-says-false-alarm-set-off-its-air-defenses-idUSKBN1HO12N; Jack Khoury, “Syria Blames Missiles, False Alarm on 'Joint Electronic Attack' by Israel and U.S.,” Haaretz, April 17, 2018, https://www.haaretz(. )com/middle-east-news/syria/syrian-state-tv-says-missile-attack-on-air-base-thwarted-1.6009200; Damascus Now, Facebook, April 16, 2018, https://www.facebook(.)com/dimashq.now/videos/1609507962508143/. Syria Today, “Israel Destroyed a Freshly Delivered Russian Pantsir-S1 (SA-22) Greyhound System in Syria,” YouTube, May 10, 2018, https://www.youtube.com/watch?v=Z3wANsgkbOo; Sebastien Roblin, “Israeli’s Deadly Air Force Has Been Destroying Syria’s Russian-Built Air Defense Systems,” The National Interest, May 21, 2018, https://nationalinterest.org/blog/the-buzz/israelis-deadly-air-force-has-been-destroying-syrias-russian-25881; Judah Ari Gross, “In Addition to Iranian Targets, Israeli Airstrikes Pummel Syrian Air Defenses,” Times of Israel, May 10, 2018, https://www.timesofisrael.com/in-addition-to-iranian-targets-israeli-strike-pummels-syrian-air-defenses/.